Cal Poly’s Master of Arts Degree in History is tailored to students who want to pursue graduate studies and careers in public history, education, museums and local or state government. This two-year program takes students deep into particular cultures and eras and hones their command of historical research and analysis. The program also develops students’ critical thinking, written and oral communication, and their understanding of the rich diversity of human experience. Students in the program work closely with faculty mentors in seminars and in a range of independent projects. An introductory seminar to graduate studies prepares students for graduate seminars on topics in United States, European, East Asian, Latin American, African, Middle Eastern and Comparative History. 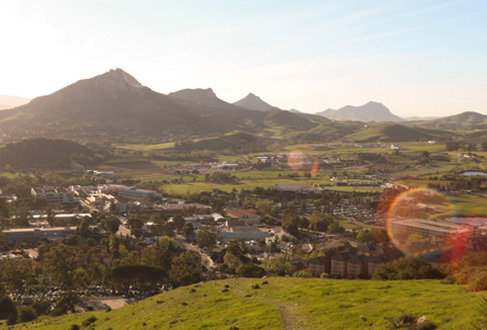 To finish their master’s degree at Cal Poly, students undertake either original historical research, by writing a thesis, or deepen their expertise in two historical fields of their choice, through the comprehensive exams option. The M.A. program focuses on rigorous historical methods while allowing students the flexibility to tailor their study to match their interests and meet their goals. The program’s emphasis on practical application of skills and knowledge is reflected through the History Department’s well-established internship program. Cal Poly’s History M.A. program supports lifelong learning and welcomes members of the community interested in continuing to study History. 1. Diversity: Construct a self-critical academic perspective on human diversity and social, cultural, political, economic and philosophical traditions. 2. Critical Thinking: Demonstrate skills of historical critical thinking and intellectual discipline: conceptualizing, applying, analyzing, synthesizing, and evaluating materials originating from historical observation, experience, reflection, and reasoning. 3. Knowledge: Demonstrate a breadth and depth of historical knowledge and an understanding of change over time. 4. Historiography: Demonstrate the ability to engage in, interpret, assess, critique, evaluate, and make constructive use of major historiographic debates in various historical fields. 5. Research: Demonstrate the research skills appropriate to a master’s-level historian, analyzing and interpreting primary and secondary historical materials from different fields. 6. Communication: Demonstrate the ability to effectively communicate historical knowledge, interpretations, and arguments, in writing and in oral presentations. 7. Engagement: Participate in vibrant intellectual communities, seeking out and respecting others’ ideas while working to construct one’s own positions and approaches as a historian. 8. Perspective: Construct a broad perspective on the past that enables one to better understand and evaluate the complexities of history and its relevance to one’s own time. Learn more about how to apply to the M.A. History program and please see our Program Guide to Graduate Study (PDF) for program details and requirements (also available as a fully-accessible "text-only" PDF). If you have questions or would like more information, please contact the Program Director, Dr. Andrew Morris.